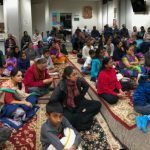 By Divine Grace, Sri Poornima ji, took Cypress, TX by storm, by conducting a three day lecture series, “Bhavayami Raghuramam” – How many devotees saw Lord Rama through their eyes, on February 21-23 2018. 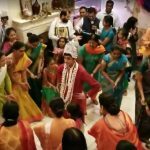 While all the participants – kids, adults, seniors included all know Ramayan very well, still it was indeed a very unique perspective given by Poornimaji to explain the qualities of the Lord and the devotees through many new angles. 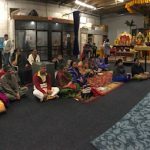 More than 75 devotees attended the event on each of the first 2 days, and on the final day, 150+ people joined and received the grace of the Lord. 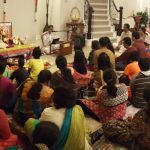 On Day 1, the satsang was hosted by Smt Lakshmi ji and Sri Prabhakar ji where Sri Poornimaji spoke on Rama Guna through the eyes of Lakshmana and Sita Devi. 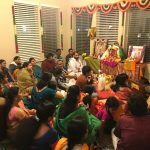 Day 2 katha was hosted by Smt Priya Ji and Sri Prasad Ji with the devotees Bharatha and Vibhishana highlighting their Lord Rama’s qualities. 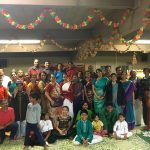 Final day’s satsang was a special Sita Kalyanam conducted by Sri Ramaswamyji and other Bhagavtas. 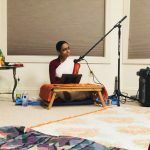 Poornimaji spoke on the greatness of Hanumanji and concluded with a reverberating chanting of Kaliyaiyum Bali Kollum kirtan of Sri Swamiji.